The Property of a California Collector; Christie's, New York 23 May 1995, lot 245. Louis-Gabriel Féloix, maître-fondeur in 1754. Ordre 80 du 19 mars 1787...Féloix fournira pour Madame Adélaïde à Versailles 3 paires de bras à trois branches, dessin arabesque, conforme au modèle présenté à Madame Adélaïde...', whilst the second was hung in Marie-Antoinette's bedroom at Saint-Cloud: 'Mémoire d'Ouvrage de bronze faite (sic) et fourny à Monsieur Horé pour le Garde-Meuble de la Couronne par Félois, fondeur-doreur. Pour le service de la Reine à Saint-Clous, le 6 9bre. Savoir: Avoir fait et livré deux paires de bras à teste d'aigle et guirlandes de fleurs, preste à estre doré, destiné pour la chambre à coucher de la Reine à St Clous, à raison de onze cent livre la paire, fait pour les deux paires la somme de 2,200l.. The sum of 2,200 livres was paid to Galle for gilding. A fourth pair appears to have been cast and delivered along with the other three, but this was intended to remain in the Garde-Meuble (Ordre du 80 du 19 mars 1787 Féloix fournira...Une paire idem, pour rester en magasin). In 1794, as objects deemed suitable for possible trade by the Revolutionary Government, the Saint-Cloud wall-lights were confiscated by the Commission du commerce pour les échanges, and transported to the Garde-Meuble National. As P. Hughes has suggested, the Saint-Cloud ones are probably those acquired by the 4th Marquess of Hertford in the late 19th century, and recorded, first in the 1871 inventory of the rue Taitbout and later in 1890 at Hertford House, in the Reynolds Drawing Room (op. cit., p. 1425). A number of sets or pairs of wall-lights of identical design, but lacking the upper thyrsus are recorded. Of these, a pair originally from the Russian Imperial Collections, was subsequently sold in 1928 from the collections of the St. Petersburg museums (R. Lepke, Berlin, 6-7 November, 1928, lot 134-5) and it is interesting to speculate when this pair found its way to Russia. In 1798 the Emperor Paul I had lifted a ban on all imports from France for a special order of bronzes to be imported into the country for the furnishing of his palaces. Over 500 exceptional ormolu objets d'art were shipped to the Russian Court (I. Zeck, 'Bronzes d'ameublement et Meubles Français achetés par Paul Ier pour le Château Saint-Michael de Saint-Pétersbourg en 1798-1799', in Bulletin de La Société de l'Histoire de l'Art Français, 1994, pp. 141-157). Although no documentary evidence has yet come to light to support so hypothetical a provenance, the wall-lights, together with their matching barometer, certainly coincide precisely with the Emperor and Empress's taste. Furthermore, a set of girandoles possibly supplied by Daguerre to the Russian Imperial couple and now at Pavlovsk and the Hermitage present closely related branches terminating in eagle heads (P. Verlet, Les Bronzes Dorés Français du XVIIIe siècle, France, 1987, pp. 316-317). Other examples without the thyrsus cresting, possibly duplicating each other in this list, include a pair sold anonymously at Parke Bernet, New York, 5-6 November 1954, lot 51; a pair in the possession of G. Geoffroy in 1958; a pair with French & Co in 1973; a pair sold anonymously at Christie's Monaco, 18 June 1989, lot 37; and a further example discussed by Partridge in Recent acquisitions 1993, London, p. 68, no. 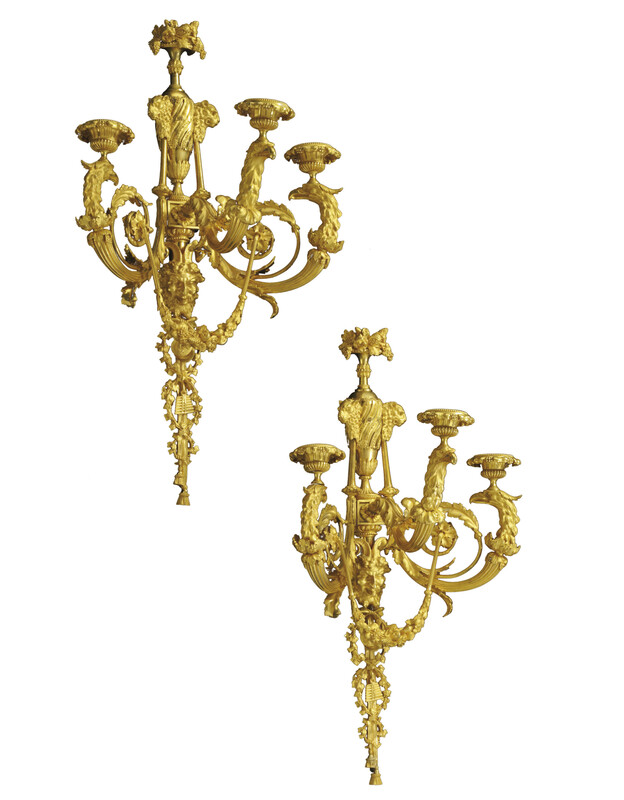 28; finally, a pair, complete with the upper thyrsus section from the collection of the Comtesse Alexandre de Casteja, was sold at Sotheby's Monaco, 3 May 1977, lot 5.